The biology of the black stink bug, Proxys punctulatus (Palisot), is not well known. It has a broad geographical range in the Americas but does not appear to damage agricultural crops as do other more important pentatomids. 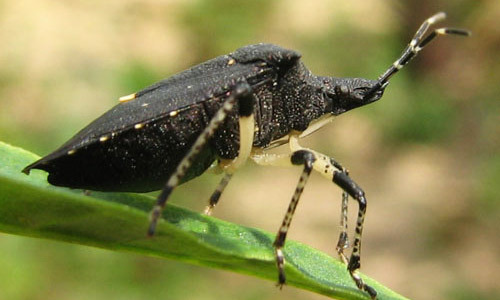 Black stink bugs appear to be facultative feeders on plants and other insects. Figure 1. Adult black stink bug, Proxys punctulatus (Palisot), on lantana. Photograph by Bill Brower, BugGuide.net. The range of P. punctulatus extends through Central America ( Honduras, Mexico, Costa Rica, El Salvador, Nicaragua), South America (Brazil), and the Caribbean islands of Puerto Rico, Santo Domingo and Cuba. In the U.S., it is found from North Carolina to Southern Florida and west through southern Indiana and southern Illinois to Oklahoma and Texas. Adults: The adults are usually colored black with black and cream legs. The head and humeral angles of the pronotum are pointed. They can be distinguished from other pentatomids by the laterally directed humeral spines, acute and reflexed tylus (distal part of the clypeus) which strongly surpasses the juga (mandibular plate in Hemiptera), and black ground color with a yellow spot at the apex of the scutellum. Their length is approximately of 11 to 13 mm. Figure 2. Dorsal view of an adult black stink bug, Proxys punctulatus (Palisot), on phlox. Photographed in Florida, USA. Photograph by Lyle J. Buss, University of Florida. Figure 3. 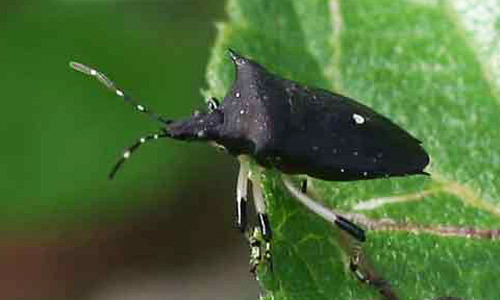 Lateral view of an adult black stink bug, Proxys punctulatus (Palisot). Photographed in Arkansas, USA. Photograph by Edward Trammel, BugGuide.net. Figure 4. 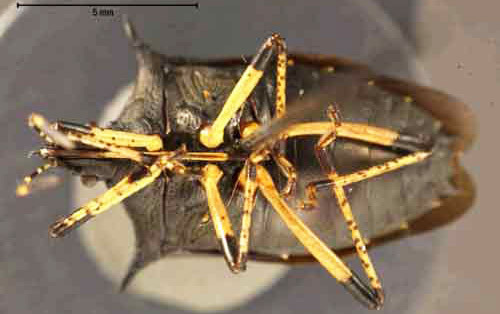 Ventral view of an adult black stink bug, Proxys punctulatus (Palisot). Collected in Florida, USA. Photograph by Harvard University. Figure 5. 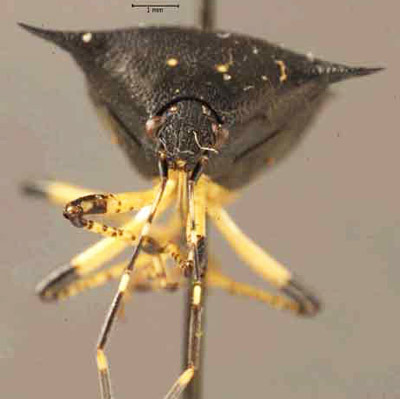 Frontal view of an adult black stink bug, Proxys punctulatus (Palisot). Collected in Florida, USA. Photograph by Harvard University. Eggs: The eggs are usually laid singly and sometimes in pairs, which is a species characteristic. All other North American pentatomids lay their eggs in clusters. The length of the eggs is 1.05mm and their width ~0.96mm. They are white and slightly ovoid. Nymphs: The nymphs go through five instars to complete development, which are distinguishable by differences in size, punctuation, antennal segment lengths and the shape of the meso and metatona. All of these differences become obvious as the insect matures. They also change in color from a light translucent brown to a dark black that characterizes them as they mature. Proxys punctulatus overwinter as adults and have been found in forest leaf litter around and beneath logs. The adults emerge during June and oviposition occurs one to two weeks afterwards. Their complete life cycle has been estimated to last 54 days. Black stink bugs usually feed and copulate on inflorescences and leaves of plants growing along margins of lowlands woods. One experiment showed that pairs remained in copulation for an estimated 1.5 to 4 hours. It is not clear whether this species is uni-or bivoltine (one or two generation) because of inconclusive data. Their unusual coloration stands out, perhaps signaling that they are distasteful for predators like birds. Some predatory stink bugs are also black, and are capable of stabbing with a strong proboscis, so perhaps the dark color also relates to stabbing behavior as a deterrent. Black stink bugs have been collected in cotton, soybean and citrus. They feed on plant juices, with some documented association with Commelina (dayflowers) species. Although the black stink bug is a phytophagous species, it can also be predaceous, and has been found attacking insect larvae in cotton. 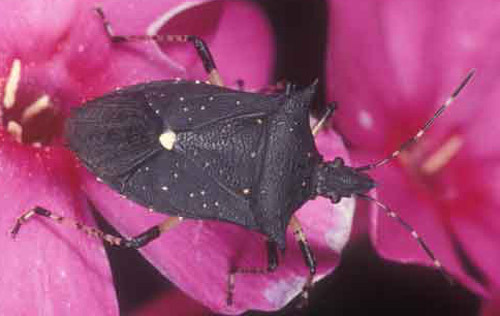 Black stink bugs feed by sucking out plant juices, producing disfigured leaves and discolored areas on plant stems. Because the bugs never reach high populations, their damage to plants is usually insignificant. Duffie et al. Susceptibility of Cotton to the Black Stink Bug, Proxys punctulatus. Georgia Cotton Research and Extension Report 2001. 261-262. Green JK, Bundy CS, Robertson PM, Leon BR. 2006. Identification and monitoring of common boll-feeding bugs in cotton. Cotton Incorporated. pp 12. Vangeison KW, McPherson JE. 1975. History and laboratory rearing of Proxys punctulatus (Hemiptera: Pentatomidae) with descriptions of immature stages. Annals of the Entomological Society of America. 68: 25-30. Publication Date: April 2008; Last revised July 2018.